Oops - we don't appear to have a video for the ScanFront 300P. A stylish, robust design makes the ScanFront 300/300P ideal for budy offices or in customer-facing environments. Ultra-compact and with direct network connections, these scanners can be easily positioned in small office spaces or on the desktop. Time-saving processing speeds of 30 pages per minute, plus a wide choice of options for sending documents across the network, help office workers capture and share information faster - streamlining workflows and increasing organisations' productivity. ScanFront 300/300Ps can be deployed, configured and updated using a simple web browser; while multiple devices can be administered simultaneously using the ScanFront Administration Tool - keeping IT costs down. 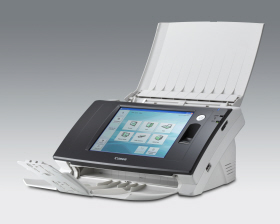 With a large colour touch screen, one touch scanning and personalised job buttons, getting great results from the ScanFront 300/300P series is quick, simple and intuitive.